In the early years of the twentieth century Shotton did not have a Church. We were part of the Parish of Easington. The people would walk to Easington Village every Sunday to attend Mass at our then Parish Church of “Our Lady of Victories”. Our Parish priest was Fr. Austin Ord his curate was Fr. Nicholas Brown. The church authorities purchased a plot of land near the Pemberton Arms public house at Haswell Moor, where they intended to build a church and a school for the people of Shotton and Haswell but the site was found to be unsuitable.The present site at Fleming Field became available and the church of “Our Lady Of Lourdes” was built in 1921, it was a prefabricated type of building built to last about 10 years (in fact it lasted over 50 years) it was condemned and demolished in 1979.About seven years later a school was built along side the church and as we were still part of the Easington Parish the Easington children attended school in Shotton. 1940 to 1979 We became a Parish in 1940 our first Parish Priest for the new Parish of Shotton was Father Blenkin followed by Father Vokes. 1979 to 2016 In 1979 our church was condemned and demolished when Rev. Joseph Vokes was our Parish Priest. In 1982 our present Church was built when Father Seamus O’Kane was Parish Priest it was dedicated by Bishop Swindlehurst in December 1982. In 1995 Father O’Kane moved on to Westerhope and Father John Knaggs became our Parish Priest after spending 5 years in the Prison Service. In 1999 the early retirement of Father John Knaggs (due to ill health), and the shortage of priests we have had to revert back to sharing a priest with our neighbouring Parish of Peterlee. In December 1999 Father Seamus Doyle became our Parish Priest assisted by Father Ronnie Rowbotham. Father Ronnie Moved on to Whitley Bay in July 2001. 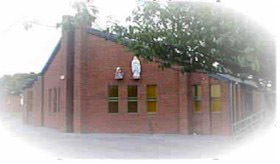 In April 2000 Father Desmond Meagher retired and moved into the Presbytery how lucky we are to have him retire to "Our Lady of Lourdes" Shotton. In July 2005 Father Zbigniew Zieba "Ziggy" moved on to Stockton after 4years he has served us well we wish him well in his new parish. In September 2005 Father Seamus Doyle moved on to Blackhills Consett after 6years we thank him for his Spiritual leadership we wish him well. We welcomed Fr. Francis McCullagh at the 10 o'clock Mass on Sunday 11th September 2005. In August 2006 Fr. Anthony Hogarth Assistant Priest retired, we wish him well in his retirement. We welcomed at the 10.30am. Mass on Sunday 3rd December 2006 Fr. Gary Dickson who has joint responsibility for the parish with Fr. Francis McCullagh. We welcomed Fr. John Masshedar at 10.30am. on Sunday 29th July 2007 for his very first Mass after his Ordination to the Priesthood at St. Mary's Sunderland on 27th July 2007 he will assist Fr. McCullagh in the Deanery. In September 2007 Fr. John Masshedar was given responsibility for the day to day running of the Parish in Easington Colliery. On Sunday February 24th 2008 Fr. Gary Dickson leaves as co pastor of Our Lady of Lourdes and back to his duties as Parish Priest at Thornley. On Sunday June 20th 2010 Father Frank McCullagh leaves as our Parish Priest. He has taken responsibility as Parish Priest of Peterlee and Easington. On Sunday 27th June 2010 Father John Masshedar takes up his appointment as Parish Priest of Our Lady of Lourdes Shotton. On Saturday 29th November 2014 Mass times were changed to Saturday Vigil Mass at 5pm. On Saturday 18th April we said farewell to Father John Masshedar we wish him and his family a long and happy retirement. On Saturday 25th April 2015 Father Sean Neylan takes up his appointment as Priest in Charge of Our Lady of Lourdes Shotton. On Wednesday 6th January Fr. Meagher passed away aged 91 years celebrating Mass right up to Tuesday 5th January God bless him. On Saturday 7th May 2016 we say farewell to Fr.Sean Neylan on his appointment as parish priest of Peterlee and Horden. We welcomed the return of Fr. Francis McCullagh at the 6 o'clock Mass on Saturday 14th May 2016.